It’s wintertime and the power goes out. If you’re like most of us, you’re not all that worried – you trust that the power will come back on soon. But when 12 hours goes by and you still don’t have any electricity, you start getting concerned. It might be days before the power comes back on. For many of us, the quick solution is to turn to wood. 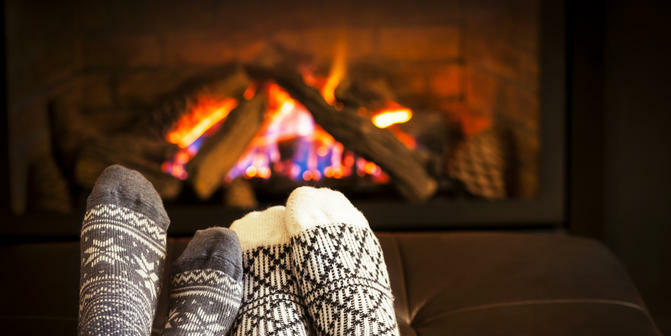 Heating with wood is historically the most common means of keeping your home warm. Throughout the centuries, people used wood to warm everything from tents to palaces. It has withstood the test of time quite effectively, providing warmth for millions of people. That makes it a survivalist’s number one choice for a back up way to heat your home. Many people living in rural areas already heat with propane. Unfortunately, their forced-air propane heater won’t work any better without electricity than anyone else’s does. However, there also are ceramic heaters, commonly referred to as “catalytic heaters,” that can be tied into the home’s propane. These allow you to burn the propane for heat without having any need for electricity. They are extremely safe for use indoors. New Solar Generators Deliver 4 Times More Power Than Previous Models! Kerosene heaters provide a considerable amount of heat, without needing electricity. I used to heat my office with a kerosene heater, back when my office was an uninsulated attic in upstate New York. If you live in a part of the country where people use kerosene for heating, then the price is quite reasonable. But if not, avoid this one, as buying kerosene at the paint store is just too expensive. Anyone who builds a home without giving it at least some passive solar capability is missing out on a great opportunity for free heat. Even if passive solar can’t heat your home, you will still save money on heating costs. Passive solar is reliable, cheap and plentiful, especially if your home is designed for it. If your home isn’t designed for passive solar heating, you can still take advantage of it. Open the curtains on all your south-facing windows during the day and put something dark colored on the floor to absorb the sunlight and convert it to heat. While not a perfect solution, it will help. The big problem for most people is having a thermal mass. This is a mass of rock or concrete that becomes warmed by the sunlight striking its surface. The surface, which must be dark, is called the absorber because it absorbs light and converts it to heat. If your home has concrete floors and you cover them with dark-colored floor covering, then you’ve got a basic passive solar system, even if the concrete isn’t thick enough to absorb much heat. Another way you can take advantage of solar energy is to build a solar convection heater to heat your home. The easiest and cheapest way to make one of these is to cut the tops and bottoms out of a bunch of aluminum soda or beer cans. Glue them together, forming tubes out of the cans that are the height of your windows and leave an opening at the top and bottom. Connect several of these together, side to side, to fill your window opening and paint the whole thing black. Since warm air rises and cool air drops, the cooler air at the bottom of the window will enter into the bottom of the solar convection heater and exit out the top, warming as it passes through. There are still many homes in the northeast which have coal bins and coal chutes into the basements, even though they are no longer heated with coal furnaces. Coal burns hotter than charcoal and will burn a long time. Essentially, coal is petroleum-filled porous rock. So what is burning is the petroleum, leaving behind the rock, which is referred to as coke. The biggest problem with burning coal is keeping it lit. It needs a lot of oxygen to burn, so you’ll have to have good airflow to the fire. It burns slowly, making it perfect to heat your home, but does produce a lot of soot. In order to use coal, you’re going to have to use it in a fireplace or a wood-burning stove that is lined with fire brick. Please note that this is only an emergency measure, as the coal will damage the fireplace or wood-burning stove. A coal insert in the fireplace is better and will allow the coal to burn more efficiently. Don’t use coal in a metal, wood-burning stove without fire brick since it can get hot enough to soften the metal, distorting it. You absolutely have to have some ventilation, or your home will fill with the coal smoke. Dried animal dung has been used by a variety of cultures throughout history for heating and cooking. While not anyone’s favorite, it works well. If you have livestock, you have a regular source of this heating fuel. Just allow them to dry naturally in the field and collect them. Surprisingly, dried animal dung burns without stinking up your home. Gasoline, diesel, oil and other liquid fuels can be burned for heat if you are careful. The problem is controlling the burn rate. This is fairly easily accomplished by pouring the fuel into a sand-filled container, such as a number 10 can. The sand will act as a wick, controlling the burn rate. There are also oil heaters that can be used to heat your home. Some of the simpler ones control the burn rate by dipping the oil from a tank into the burner. The Army used to use heaters of this sort, with gasoline, to provide hot water for field kitchens. So you might be able to find one of those heaters at your local army surplus store. The big problem with this is that you’ll go through a lot of fuel quickly, so this should be considered only if no other option exists. Ventilation is essential. The natural act of composting produces quite a bit of heat as the millions of bacteria eat the organic material, breaking it down into its basic elements. You can tap into this heat source by burying pipes in your compost pile. Those pipes can carry water to be heated or you can push air through them to heat your hpme. As long as the compost pile has a continuous source of organic material and is kept moist, it will continue to produce heat. The post 8 Foolproof Ways To Heat Your Home When The Power’s Out appeared first on Off The Grid News.